Monday morning… my gardening vacation is over and I am back to work. I never finish all that I want to do while I’m on gardening vacation, but I get a very good start. The redesigned front garden is nearly complete now; I promise to post some pictures soon. I also made good progress on general weeding and mulching. But there are still some newly purchased plants on the front porch that belong in containers and out back, in the shade, I’m still hardening off my pepper and tomato seedlings. I used to try very hard to make sure I planted the rest of the vegetable garden while I was on gardening vacation, but now I generally wait until later in May to plant it when I am sure we are truly beyond our frost free date. I have too much invested in those little seedlings to risk killing them off in a late frost. I figure that even planting a week later, by mid-summer, my garden will be all caught up with everyone else who planted theirs earlier. While I was off this past week, I did get a chance to meet up with the garden designer on Monday. She came by mostly to lay out the new garden beds in the back. I left her alone to figure it all out, and with all the rope she had, she laid out several new beds. I don’t know how she did it, but the way the beds curve and how the curves of each bed seem to complement each other is amazing. She said that if it was done right, I would always feel comfortable in the garden. So far, I do. I can’t wait to see what the beds look like once they are planted! I also met with the guy who is designing the new patio. He has some great ideas, and I think he’ll have a plan ready soon. They won’t actually start on the new patio until sometime in June, at which point my backyard will turn into a bit of a construction zone. They have to tear out the old brick patio to put in the new, larger one, but will be reusing all the bricks that are currently there. And, to bring in their equipment, they will need to remove a section of the fence and a shrub. My current brick patio is too small and is dipping down in sections. 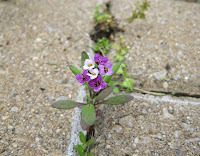 From “day one”, I’ve also battled weeds in all the cracks, like the little alyssum seedling shown above. I asked the “new patio guy” why that was and he said it was probably not installed according to industry standards but he’d know for sure once they tear it out. There’s not much I can do about that now, nearly 13 years later, but it is good to know this new patio will last much longer than that. While all that is going on with the new beds and the new patio, my vegetable garden will be left alone and will remain my summer sanctuary, where I can plant, weed, hoe, and harvest to my heart’s content. I didn’t get a picture of it today, but it hasn’t changed much from last week. P.S. As part of my garden redesign, I will be getting a gate to put at the entrance to the vegetable garden. The garden designer mentioned a “custom gate”, so I am looking through books and magazines for ideas on the kinds of gates I like, to give her some ideas. If you have any pictures of gates that you think would give me some ideas send them my way! P.S.S. It wouldn’t be right to end without a “Thank You” to all my “gardening friends everywhere” who participated in Garden Bloggers’ Bloom Day on Saturday. I’m very appreciative and grateful to all who take time to showcase their blooms on their blogs and join in this Internet meme on the 15th of every month. It is almost impossible to visit everyone’s blog personally, but I try to visit as many as I can, especially those that are new to me. It is a great way to discover, and sometimes rediscover, some great garden blogs and gardeners. Thank you! Carol, it sounded like a very productive gardening vacation. A custom gate sounds like a fun idea. I hope you get lots of great ideas. H.
Your Welcome Carol..GBBD is a fun meme I enjoy it and I get to meet new friends thanks to you while I'm at it. I enjoy your blogs and the things that you do. Hope your new garden evolves over time to bring you new surprises and joy every day and every year! 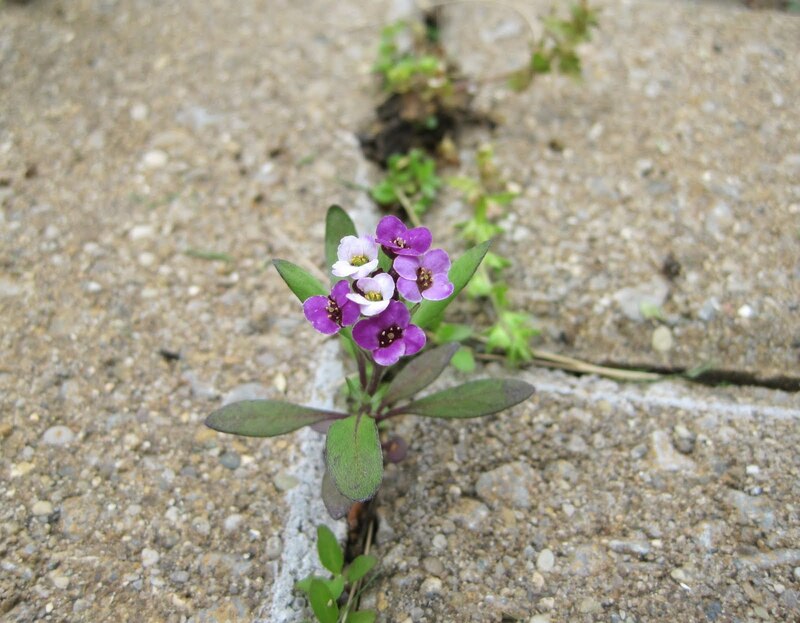 There's no point in putting heat loving plants in the ground until the ground has warmed up. They'll just sit there. It hard to wait, but you are wise to do so. A custom gate! How exciting! I got a garden sculpture from them and it's absolutely beautiful.